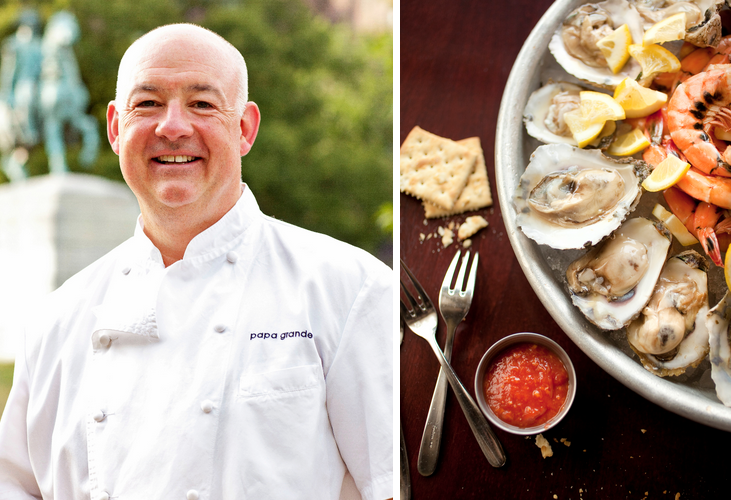 If you order as many oysters as Chef Jeff Tunks does, your suppliers are bound to take notice. And if you’re as strong an advocate for the seafood industry as the veteran chef is, they may well name shellfish after you. Maryland native and Executive Chef of DC Coast, Miles Vaden, went a step further and had Hollywood Oyster Company craft the perfect mollusk to shuck up to his boss… and now, they have just bestowed the honor of a custom oyster dedicated to Tunks. Like its namesake, the proprietary oyster is affectionately known as “The Big Daddy.” And while the nickname sticks, the pounds have not after Tunks shed 125 pounds, but still stands tall at 6-foot-3. The tribute is indicative of the lasting relationships that Tunks has cultivated with farmers, producers, and growers throughout his career: when a chef-restaurateur cares the way he does, it’s not just a name on an order form, it’s personal. ‘The Big Daddy’ will now have a place of honor at the popular raw bars of DC Coast, PassionFish [second location opening in Bethesda, MD summer 2015], District Commons, and Penn Commons, a true bond between the chef and his oyster-grower. Be sure to ask for it by name! This entry was posted on February 4, 2015 by Simone in Chef Jeff Tunks, Chef Miles Vaden, DC Coast, Oysters, Passion Food Hospitality, Seafood and tagged Chef Jeff Tunks, Chef Miles Vaden, DC Coast, Oysters, Passion Food Hospitality, Seafood.